Bosch PR20EVSK will be a good addition to the tool collection of an advanced woodworker or any person with some experience in woodworking. It can also be purchased by experienced do-it-yourself hobbyists for work around the house. It is a versatile router that can be used to carry out a lot of woodworking projects such as routing, dovetailing, dock planks, cutting, mortising hinges, trimming laminate flooring and others. Though it is available in a compact size, it boasts of impressive performance required for precision, accuracy and improved comfort. But before you think that you have found your ideal router table, first read through this piece to know the various its features, pros, and cons. This Bosch wood router is equipped with a powerful motor of 5.6 amp. Spinning at a variable speed of 16,000 to 35,000 RPM and with a 1.0 horsepower which is the highest a router of this class can deliver, the motor provides enough power that makes routing and other carpentry work very easy to accomplish. The user manual provides users with a chart that indicates not just the speed of each set but also the type of work the speed of each dial position is meant for. The base of the fixed base router features a wheel for micro-fine adjustments. This Bosch router has features that are very easy to use. 1/4-inch bits can be used on its collect. Unfortunately, 1/2 bit shanks can be used on it. With one wrench, you will be able to change the bit because of the front spindle lock on its motor. However, in case you like using two wrenches, the package also comes with a shaft wrench. The speed dial can easily be accessed because it is located on the top of the router. 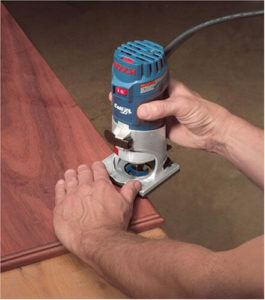 The router comes has a number of features that make for convenience and safety during routing. For example, the router is a corded type but its cord does not constitute an obstacle to the user during work because it is safely kept out of the way with an angled cord exit in the machine. For easy adjustment and movement from base to base, the manufacturers include the quick-clamps system for this product. It is the corded router as per my opinion. The package comes it all that you will require starting routing which includes edge guide, fixed base, instructional manual, shaft wrenches, fixed base, edge guide. and plunge base. For easy carriage and enhanced portability, it is provided with a case. Value for money as the package includes most of the things required for basic routing. It is a user-friendly tool. You don’t need to be an experienced woodwork to be able to operate this router. It is a flexible and portable router as it can easily be been taken to work thanks to the case included. It can be used for different routing works. It is important that you use wear hand gloves when working with this router as it can become very hot during use. The absence of side handles is a big lack of this product. The edge guide does not have any notches or markings. PR20EVSK is a compact size router which can be used to carry out different kinds of woodworking. Even though complaints have been made about the design of its spindle lock button, it is a value for money given its performance and versatility. But if you are looking for a fixed base router that will handle tougher projects, it may not be what you are looking for.